red, orange, yellow, green, blue, indigo and violet, 7 colours in total. Cakey drew a rainbow as I listed each colour. Cakey wanted to draw a unicorn at the end of her rainbow. She started drawing one in green and then got angry as she had wanted to draw it in pink. I encouraged her to draw another unicorn in pink and we cut it out and stuck it over the original. I thought that would be the end of rainbow time but NO. 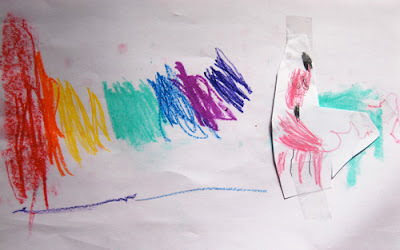 The drawing did not take her mind off her original intention – to make a rainbow. So I cut out six strips of coloured paper (indigo and violet just became purple) and gave her six corresponding coloured paddle pop sticks. She busily sticky taped the paper to the sticks and then stuck them into plasticine to stand up. That was the easy part. 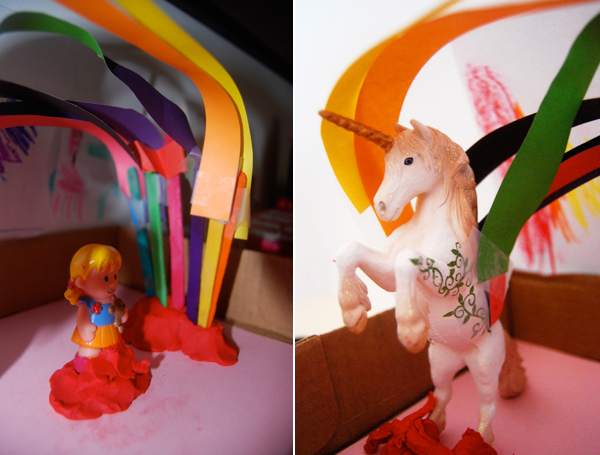 Next was the hard part – We grabbed her toy unicorn and Cakey tried to sticky tape the ends of the paper to the unicorn. The unicorn fell over, the paper got squashed, the sticky tape came off and tears started to fall. 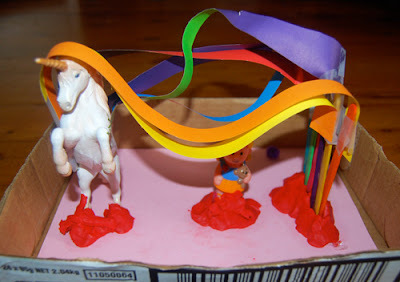 To rectify our pending rainbow disaster I stabilized the unicorn in some plasticine and helped to sticky tape the paper to him. When we had finished, the paper did stand up in an arch... but it didn't stay that way!! Cakey could help touching it and the paper started to flop down, but it looked fabulous anyway. As a final touch Cakey placed a little figurine underneath the rainbow. Cakey now wants a rainbow themed 4th birthday party – so look out for more rainbows coming your way. Critters and Crayons has recently written a great rainbow post with the most amazing rainbow cupcakes. Also, check out the amazing rainbow painting with a sponge from Hands on : as we grow. How cute! Goodness, Kaia is all about unicorns and rainbows as well, and they were a big part of her 4th birthday party theme. I just (finally!) finished my post about it a bit earlier today. 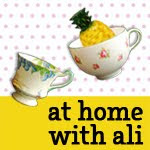 I am totally trying that rainbow sponge trick, Kaia will go crazy for it! this is so much fun! i used to love unicorns as a little girl. i had a ton of them! i have a rainbow post today too! i added this as another resource for my readers! I love that! Who wouldn't love the combination of rainbows and unicorns. And the drawing is so precious! What a wonderful play scene. I like the idea of using paper (a simple source) to make the rainbow.